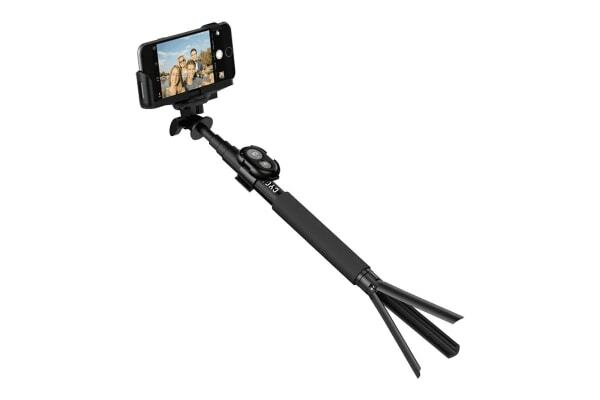 Take the perfect photo each and every time using this sturdy, bluetooth selfie stick! Compatible with GoPro cameras and smartphones including iPhone, Samsung Galaxy and more! Capture your best angle and always be a part of the action with this extendable GoStick, tripod and remote, featuring a secure universal cradle for your smartphone or mount for your GoPro mount compatible camera. Trigger your shutter with the Bluetooth remote that attaches neatly to the stick, or use it to trigger exposures remotely for photos, videos and time-lapse sequences. The collapsible tripod enables hands-free photos anytime, anyplace.